Originally a medieval fortified manor house, founded by Ednyfed Fychan. 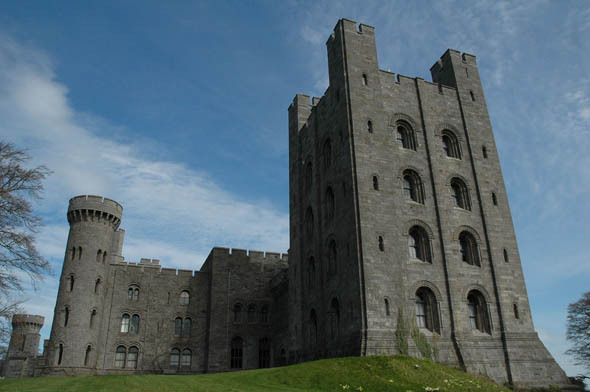 In 1438, Ioan ap Gruffudd was granted a licence to crenellate and he founded the stone castle and added a tower house. Samuel Wyatt reconstructed the property in the 1780s. The present building was created between 1820 and 1845 to designs by Thomas Hopper, who expanded and transformed the building beyond recognition. Hopper’s clients were the Pennant family, who had made their fortune from Jamaican sugar and local slate quarries. 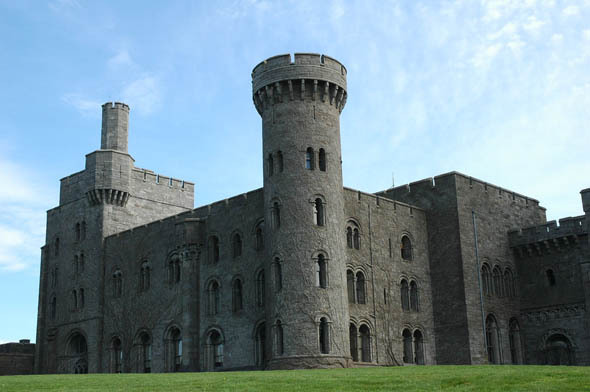 Penrhyn is one of the most admired of the numerous mock castles built in the United Kingdom in the 19th century; Christopher Hussey called it, “the outstanding instance of Normal revival.” It is in a very solid, sombre style which allows it to possess something of the medieval fortress air despite the ground-level drawing room windows. Hopper designed all the principal interiors in a rich but restrained Norman style, with much fine plasterwork and wood and stone carving. In 1951 the castle and 40,000 acres of land were accepted by the Treasury in lieu of death duties. It now belongs to the National Trust and is open to the public.